Here is a winter Scene for you! 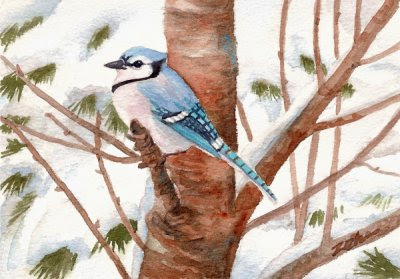 When I looked out my studio window yesterday, I saw this Blue Jay all fluffed up against the cold. Behind him, the snow is piled high on the evergreens until they are barely visible. All you can see are a few green needles sticking out. After all the snow was shoveled out of the walkways and driveway yesterday, it snowed again today. Only 6 inches this time instead of 8. It is quite beautiful out there and once the sun comes out, it will be spectacular! There is no doubt it will be a white Christmas this year.